One card so far today. Now that I'm back in my card room I've got lots of ideas swirling in my mind. I worked on my blog layout today and added my favorite challenges by the day they fall on, under all the banners I've been able to figure out how to retrieve so far. I did not put on there and I should put it at the top of those the Mother of all challenge blogs http://dailydare4u.blogspot.com . Deb Felts does a wonderful job of providing lots of sites to fuel all our junkie fire. I think I've hit 5 challenges with this card. 3 of the challenges had very similar colors, one wanted Things that go Bump in the Night, and one is the sketch with a spin, we were to use something recycled, I used a piece of chip board from the bottom of the sack that my cats food came in to stamp and emboss my purple ghost. Check out the clickable links below for lots of great inspiration. Supplies: Card Blank: Black 5" X 61/2" Value Pack Hobby Lobby, Designer Paper: WeRMemory Keepers Halloween Scrapbook Pad, buttons, photo tab, and look out arrow from that pad also, Stampin Up papers: pumpkin pie, crushed curry, apricot appeal, Doodlebug Designs: purple velvet brad, Stamps: Little Yellow Bicycle-HW210, Ranger Distress Tool, Inks: Ranger Archival Ink: Jet Black, CTMH-Z2161-Petal, VersaMark Ink Pad, JoAnn's Clear Embossing Powder, CTMH markers: black, sunflower, Stampin Up marker: dusty durango, orange hemp cord,black pop dots. Cute and fun card to the Sweet Stop Challenge....love the fun colors too....we are happy you joined us for the challenge this week and hope you will return each week for the newest challenges. Great card. Thanks for joining in with us at Cupcake Crafts this week. How fun!! Fantastic take on our sketch! Thanks for joining us at The Sweet Stop! 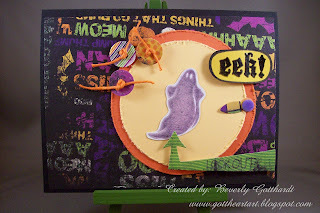 Very cute - don't you love purple for Halloween? Fabulous halloween card. Thanks for joining us at CCC. Great card, and fantastic job combining all those challenges. so glad you joined us this week at SPCC! Very cute card! Great job! Oh!! This is too cute and so fun! WTG.